Uvextreme anti-fog coating offers superior performance in extreme conditions and will withstand repeated cleanings. Clear toric lens provides superior optics and vision in most work environments; easy and economical snap-on lens replacement. 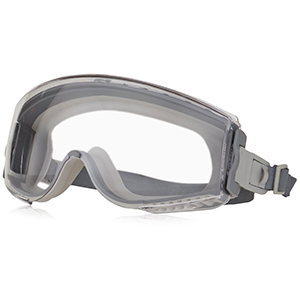 Contemporary low-profile design protects comfortably against impacts and chemical splashes; prescription compatible frame. Soft, elastomer body flexes and conforms to the face for a secure, comfortable, gap-free fit; pivoting, quick-adjust neoprene headband provides easy adjustment for a comfortable fit. Indirect ventilation system minimizes fogging; meets ANSI Z87+ and CSA Z94.3; made in the U.S.A..